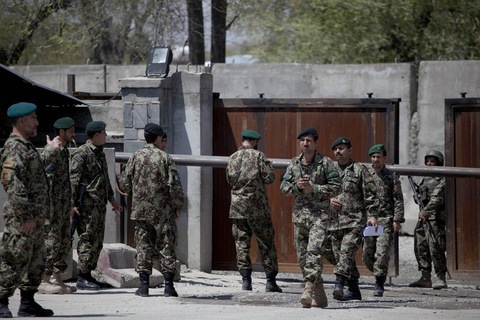 A man dressed in an Afghan army uniform and explosive vest opened fire inside the defense ministry in Kabul, killing two people and wounding seven others. The Taliban claimed responsibility for the attack and had previously referred to Afghan Defense Minister Abdul Rahim Wardak as a “puppet.” Wardak was not inside the building when the attack took place. It is not yet known if the attacker had joined the army or had obtained the uniform some other way to infiltrate the building. In order to gain access to the building, he had to pass through checkpoints and provide identification. He was shot by bodyguards as he attempted to reach the second floor offices. The Taliban told the Associated Press that the attack was also intended to target Gerard Longuet, France’s defense minister, who was also not present. The attack follows several deadly attacks in Afghanistan in the past week, including a suicide bombing that killed five NATO troops, four Afghan soldiers and an interpreter at an army base in Jalalabad, a suicide attack at police headquarters in Kandahar that killed the city’s police chief and a suicide attack on a training center in Paktika province. With continued shelling by Moammar Gadhafi’s forces and a dire lack of supplies and medical care, an opposition spokesman said that NATO has had a thin presence in Misrata as the hardships mount for the city’s civilian population. Humanitarian groups have cited the dire situation in the western city and said another 17 people were killed on Sunday. Britain has said it will pay for the evacuation of migrant workers who have been trapped in Misrata, which has seen constant fighting for two months and is the only western city with an opposition presence. There was also fierce fighting in Ajdabiya and reports of shelling by government forces. Robots entered two of the Fukushima Dai-ichi nuclear plant’s reactors Monday and found unsafe levels of radiation in both, preventing workers from entering units 1 and 3 as repairs continues on the crippled facility. Workers have not been able to enter those reactors since the plant was damaged by the March 11 tsunami and earthquake in eastern Japan. The remote-controlled robots are designed to take photos and readings to provide data without further endangering workers at the plant. Officials say they still plan to have the facility stabilized by the end of this year, but criticism from the public and lawmakers has increased pressure on Tokyo Electric Power Company. A series of powerful storms over the weekend claimed 45 lives in North Carolina, Virginia and several other Southern states. The National Oceanic and Atmospheric Administration’s Storm Prediction Center said witnesses reported more than 200 tornadoes, though their size and scope was not yet verified. North Carolina Gov. Beverly Perdue, who toured the damaged counties, said she had requested federal emergency aid from President Obama. Among the fatalities were an 8-year-old girl in Virginia who was caught in flash flooding.